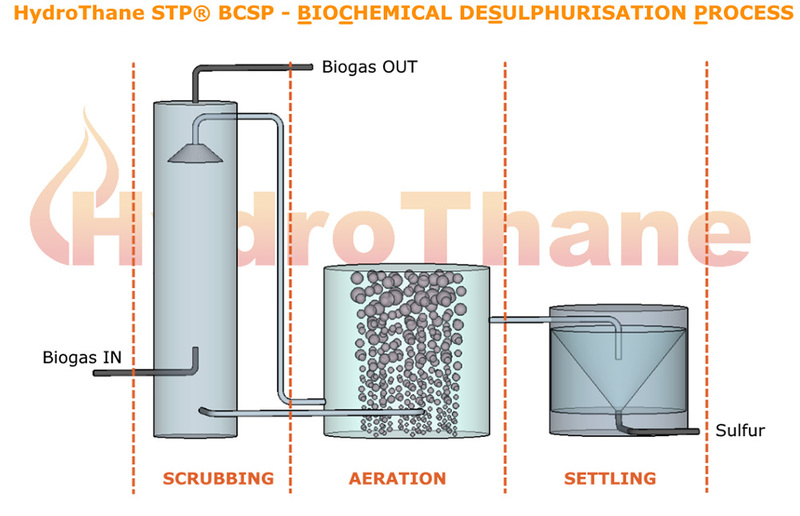 The BioChemical DeSulphurisation Process (BCSP) from HydroThane is a simple biological process that removes hydrogen sulfide (H2S) from biogas with a minimal use of chemicals. The biogas is fed into vertical scrubber column(s) with a packing media inside. In counter current flow, a slightly alkaline washing liquid is used for absorbing the H2S and cleaning the biogas (reaction 1). The HydroThane STP® BCSP can be seen as a combination of a conventional chemical scrubber and a biological oxidation step. The sulfide rich washing liquid is forwarded to the aeration tank. A controlled amount of air is pumped in to provide sufficient oxygen for the sulphur oxidizing bacteria. The main part of the alkalinity consuming H2S absorption in the scrubber (reaction 1) is compensated by the oxidation reaction to elemental sulfur (reaction 2). The small amount of generated H2SO4 (from side reaction 3) needs to be neutralized by means of caustic dosing. Preventing accumulation of salts (f.e. Na2SO4) a small bleed stream is required. The produced sulfur (in the reactor tank) is separated from this effluent bleed stream by means of a settler unit. These separated, harmless, residual products can be directly discharged or reused. The HydroThane STP® BCSP is accomplished in a closed reactor system and reduces the odor, toxicity and corrosiveness of the biogas.